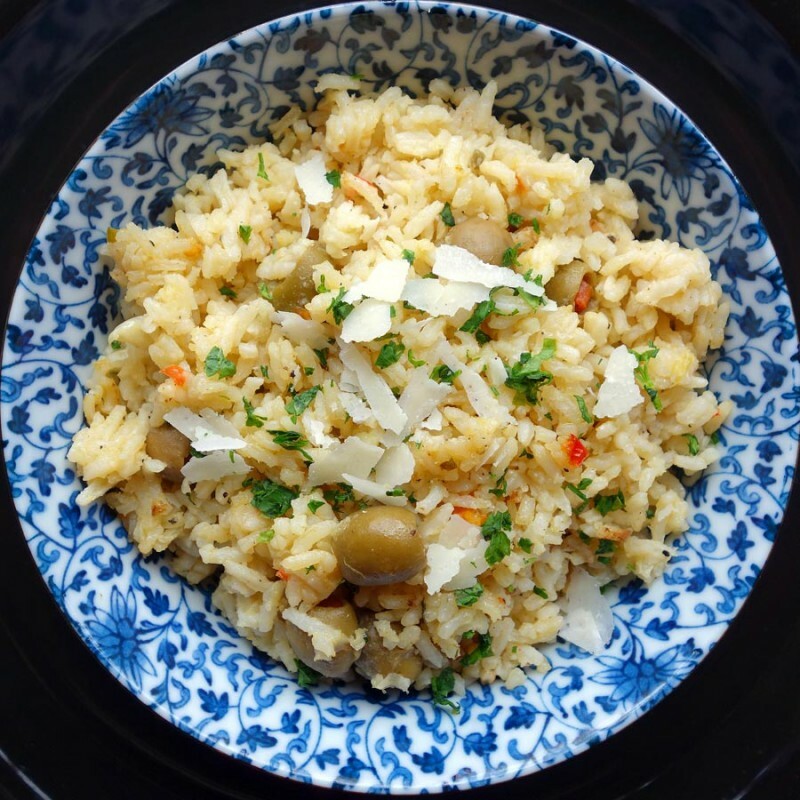 No one ever asks if I’m making Grandma’s Rice, a buttery, cheesy rice pilaf studded with green olives, for Thanksgiving because it’s the law. I always make a lot so there’s leftovers. It was my Grandma’s tradition that she not only stuffed her guests, but they got food to take home for the next day. I won’t twist your arm to take food home like she did, but I make enough if you’d like to. Giving away our leftovers made my brother wince, but tradition is tradition. Now he always brings his own stack of take-out containers. In a 4-6 quart heavy bottomed saucepan, over medium heat, melt 4 ounces of butter. Add onions and garlic and sauté until the onions are translucent. Add celery stalks, celery leaves, red pepper and season with 2 teaspoons of kosher salt and a couple of grinds of pepper. Cook for 3 minutes. Add the rice, then lower the heat and continue cooking and stirring until the rice loses it’s translucency and starts to smell nutty. Add the stock, bay leaves, thyme and olives, 1 teaspoon of kosher salt, then stir to incorporate and put on the lid. Cook without stirring for about 20 minutes, until the stock is absorbed. Allow pilaf to sit for 5 minutes with the lid on. Stir in remaining butter and Parmesan cheese. Adjust seasoning with salt and freshly ground black pepper as needed. For Thanksgiving, I like to make the rice ahead of time and reheat it in a baking dish dotted with butter and maybe even some more Parmesan cheese.